Come visit our academy in Seville and learn about our flamenco guitar lessons for accompanying dance. Here you can learn diverse techniques, the skills to play the guitar and essential concepts to accompany flamenco dance. Depending on whether it is appropriate for you, you can also find opportunities to play alongside your guitar teacher during the academy’s general dance classes and experience guitar accompaniment for dance firsthand during these dance lessons. 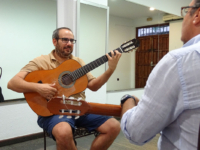 Our guitar lessons are taught by Dani Vélez, a professional guitarist who specialises in dance accompaniment at our academy in Triana, Seville. These classes will help you learn the difference that exists between accompanying flamenco singing and accompanying flamenco dance. 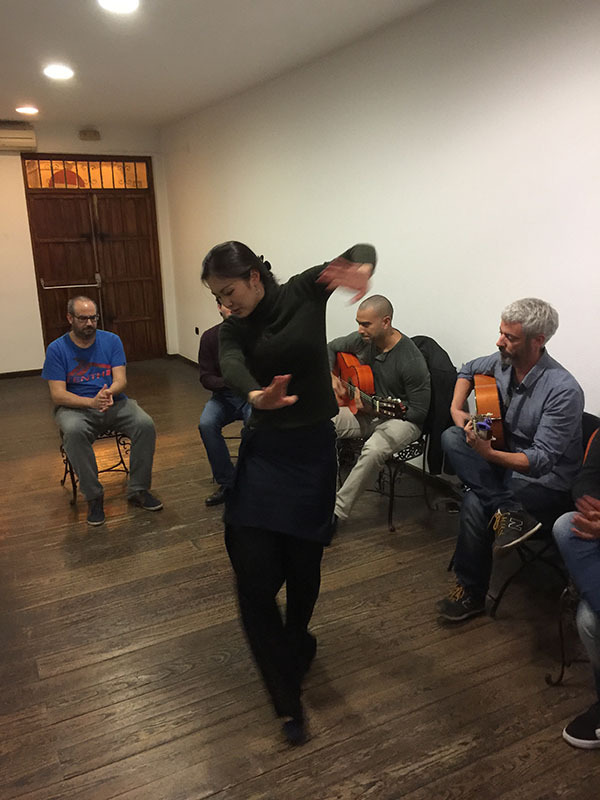 This focus on accompanying dance offers a solid foundation for understanding the language of flamenco dance where you will learn the codes that connect the singing, dancing and flamenco guitar. 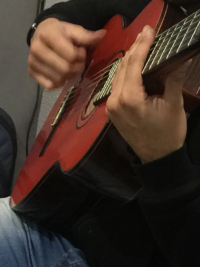 Our guitar lessons for dance accompaniment will start by taking your level into consideration on an individual basis and from that point, will offer a wide range of skills, techniques and styles (at an appropriate level for you) to develop your ability to follow the dance. 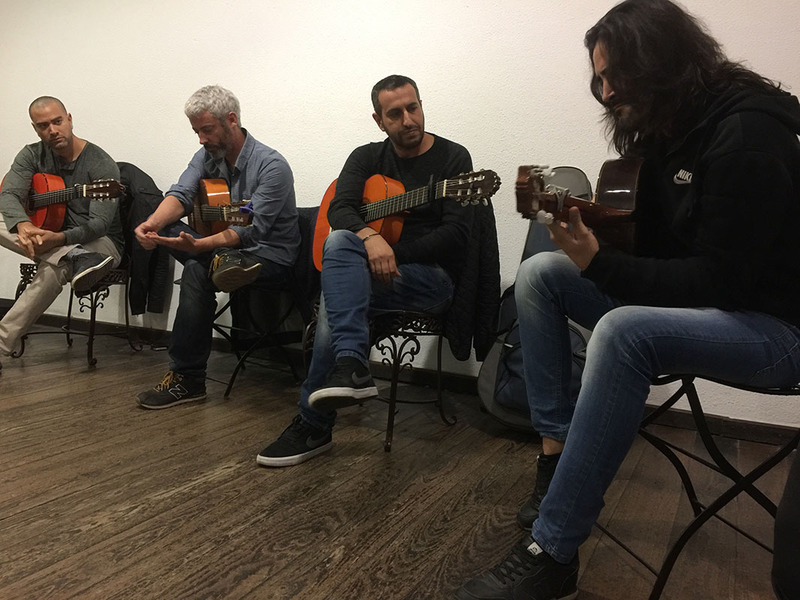 As you progress through learning the different techniques, you will develop not only your skills with flamenco guitar but also gain familiarity and expand your experience in the art of accompanying flamenco dance. 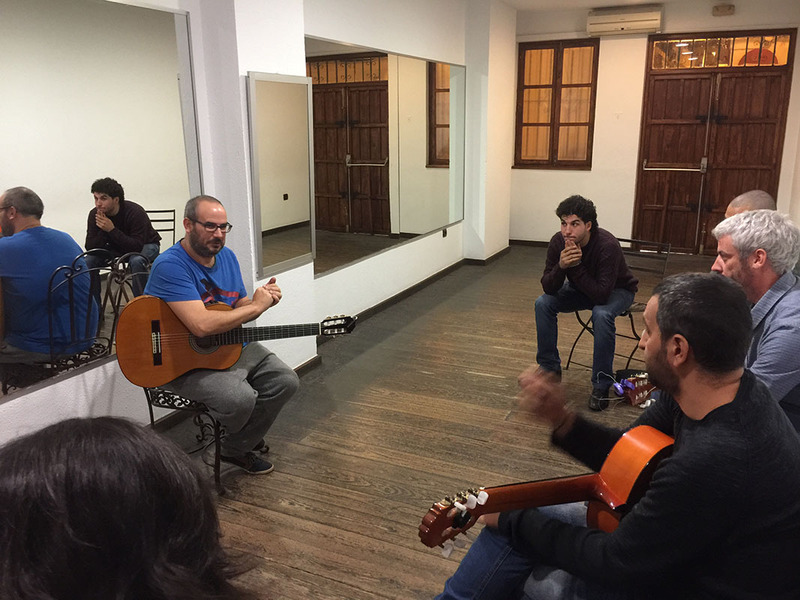 The methodology used in our academy´s guitar classes is tailored to the student´s needs so you can develop the skills and agility you need for accompanying the dance. The guitar lessons are adapted to your skills and learning pace, regardless of your age. Knowing the rhythm, the character and the essence of each flamenco palo (style) is essential for guitar accompaniment. 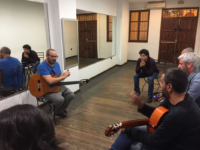 In our academy we welcome guitar students of different styles who want to learn Flamenco. For students with some guitar knowledge but who do not know flamenco, we try to make the most of your existing technical and musical knowledge and adapt it to flamenco dance accompaniment. This approach of building on previously acquired knowledge makes our guitar lessons very productive. 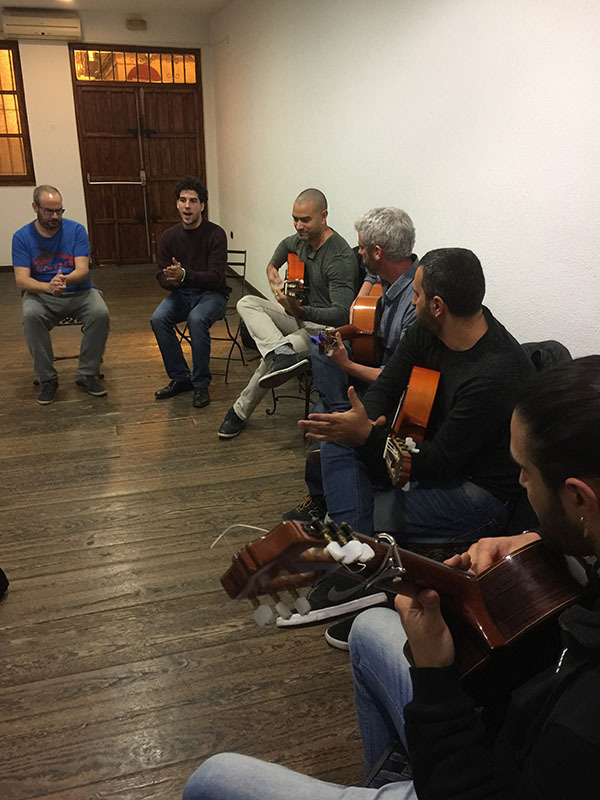 Dani Vélez is highly experienced in teaching flamenco guitar and the aim of his lessons is for you to gain knowledge and continually improve towards effective dance accompaniment. Base, technique, theory, nuances, falsetas – all of this work will be approached using a palo chosen by your teacher. This work can be further enriched by playing alongside your guitar teacher for the academy´s dance students and teachers. This way, your guitar courses are reinforced by your regular participation in our general dance classes where you can experience dance accompaniment alongside your teacher from 5:00 to 8:00PM. This provides an opportunity for you to practise the knowledge gained during the dance accompaniment classes in our academy in Seville. 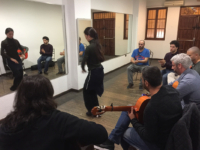 This holistic immersion is one of the goals of our guitar lessons in our flamenco dance academy in Triana, Seville. 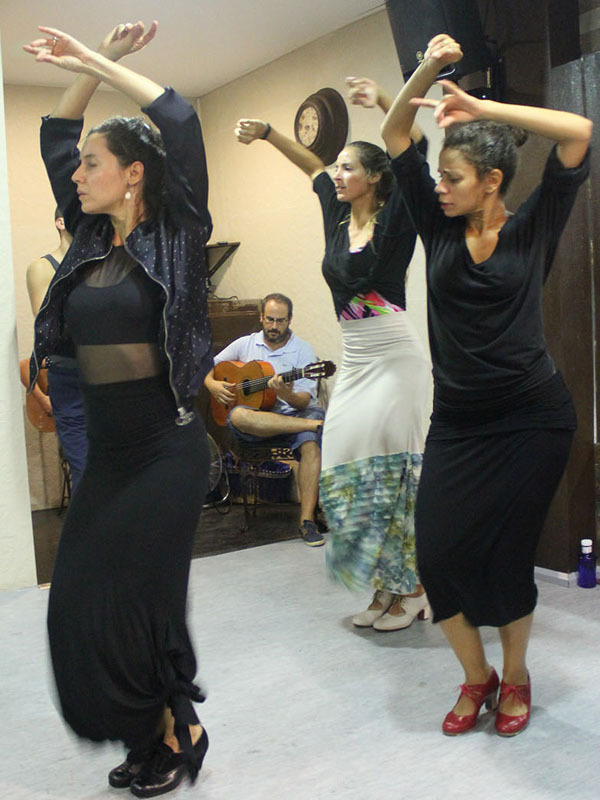 If you want to learn to play the guitar for flamenco dance accompaniment, we offer the lessons you are looking for. Visit our academy located in Triana, the birthplace of flamenco in Seville. Come and meet us! Address: Rodrigo de Triana, 30. 41010 Seville. Meet Dani Vélez, the traditional yet avant-garde young guitarist at our academy. If perfection exists, then in him, we have a perfect accompanist for flamenco dance. And with his full dedication and enthusiasm for teaching, you’ll have an ideal teacher if you want to learn to play the flamenco guitar in Seville. Aficionado of flamenco song, he is attentive to the finer details of punctuating and concluding musical phrases, enhancing the dynamics and nuances of accompaniment. You’ll see this sensibility of his flourishing from the classroom to the performance stage, and vice-versa. Dani has acquired much experience performing in many flamenco festivals, peñas and platforms such as the Ciclo Jueves Flamencos de Cádiz and played alongside guitarist, Manuel de la Luz with singer, José Valencia, dancer Mercedes Ruiz and percussionist El Pájaro. His artistic collaboration has seen him performing in the renowned tablaos of Seville such as Los Gallos and La Casa de la Memoria. He has participated in television programmes, notably one for Japanese superstar Tsubasa Imai, recorded at Seville’s famed tablao, El Arenal. His international touring engagements have taken him to countries including France and Japan. 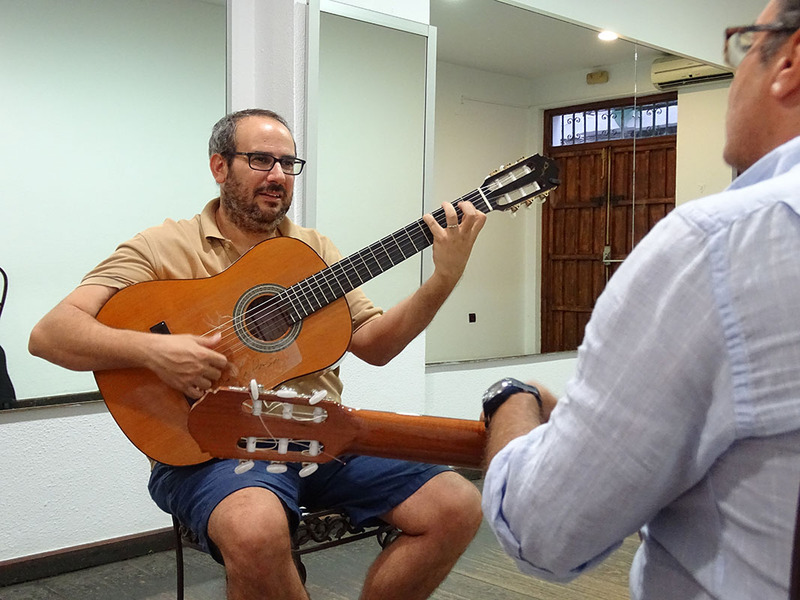 Dani is currently an official flamenco guitar teacher and accompanist in the Academia de Flamenco Manuel Betanzos.